They’re orange in the picture on this page, but you can see the reason for the yellow pin-with-hole pieces here. https://engineerfeed.com/liebherr-9800-mining-excavator/ The pieces of this machine weigh hundreds of tons, and the orange/yellow hooks are for lifting each piece into place with cranes. I wish I had a LEGO crane that was the same scale. I think 42100 is going to be around 1:38 scale. It looks like the orange pins are used to easily disconnect the boom and 4 LAs while leaving the 2 boom lift LAs attached to the machine in the same way the real machine is assembled. At least I hope that’s the reason for the color... I think I see some 3L orange pins holding the swivel mechanism together too. I hope LEGO makes 42100 a modular build like I did with this RH400 I made in 2011. I like the way they’ve been making the instructions mirror the building process of the real machines lately. More work completed on hull of Queen Mary 2. I completed the section of levels 3 and 4 containing the Britannia Restaurant and Grand Lobby. These are the most awe-inspiring public rooms on the ship. Parts of the elevator shafts and stairwells are sticking up out of Level 4. You can also see the grey capped-off exhaust ports from the diesel engines in the belly of the ship. Over the next few months I'm going to work on the bow and stern up to Level 4. When I'm completely done, the ship will easily come apart into many sections so you can see the inner rooms. Here's the latest update pics. It's a slow process. One of the propellers is finished. Most of the bottom of the hull is done. Complete with four stabilizing fins that can be folded in and out. I added some trophy figure Lego people for scale. They're not exactly 1:200, but they're fairly close. Towards the bow you can see the "Illuminations" planetarium, and the "Royal Court Theatre" is just behind that. There is a tiny drum set in the theatre instrument pit. I'm a drummer, so I thought that was appropriate. The blue and grey equipment in the double bottom behind the theatre are the chillers for the ship's air conditioning system. Only the very bottom of the hull is built at the stern right now. I'll be adding the four propulsion pods with propellers soon. They aft two propulsion pods will be able to rotate 360 degrees just like on the real ship. You can see one of the cargo elevators sticking up and a couple of green boilers sticking out of the engine room ahead of that. I actually have most of the first couple levels of the ship built. I’ll take some pictures tonight and try to get them posted. I’ve had some issues finding rare Lego pieces but I’m still on track to finish within five years. Thanks! It’s going to be a multi year build so I decided to have fun with it and create some work scenes. I think the logos are hard to see in the first pictures because the light was coming from behind me. I took the last picture opposite the lighting and the logos are easier to see. What do you mean? All the pieces are ordered off Bricklink. 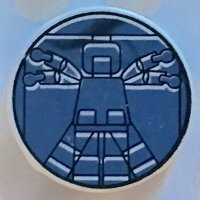 What piece doesn’t look like LEGO and how can I tell? Here’s a closer image from a different angle. Here's some pics of my queen mary 2 engine room during installation of the fourth diesel engine. Each engine is connected to a 25MW generator. Baseplates are glued to table so they won't slide around. Thanks! I’m still in the process of building. I designed the ship with LDD. It will take several years to buy all the parts due to cost. I haven’t even finished the first deck yet.